Bollinger Motors plans to add an all-electric pickup truck called the B2 that will start production in 2020, at the same time it starts to build its four-door B1 sport utility vehicle. 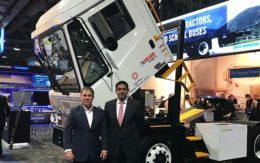 Both the B2 and B1 trucks will have the same self-leveling, four-wheel independent fluid-based suspension with ground clearance that can be raised to 20 inches. 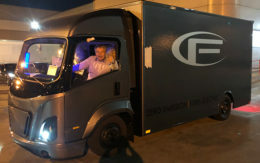 Both trucks will have a 120 kilowatt-hour battery pack that should provide an estimated 200 miles of range on a full charge. The battery can recharge in 10 hours at 220 volts or 75 minutes using DC fast charging through a Combined Charging System port. The two vehicles are powered by two electric motors, one in the front and another in the rear, that together produce 520 horsepower and 514 pound-feet of torque. Both will be classified as Class 3 work trucks with a gross vehicle weight rating or 10,001 pounds and a hauling capability of 5,000 pounds. Up through the C-pillars, the four-door version of the B1 and the B2 will look identical, Bollinger said. The wheelbase will be extended on the B2 to fit a 5-foot-9-inch bed. Thanks to an internal liftgate and a pass-through opening to the cargo compartment at the front of the truck, the B2 will be able to carry 16-foot boards in the middle of the vehicle with the rear liftgate closed. Bollinger said he hoped to start production in 2020, and the company’s recent move to Detroit was done to make sure he hits that target. The company expects to announce where the vehicles will be built in mid 2019. The company began taking no-money “reservations” for the B1 in July 2017 and now says it has more than 20,000 people who have signed up. The B1 drew the attention of off-road enthusiasts, Bollinger said. But the B2 is targeted at a pickup-centric crowd. Details on vehicle options, pricing and delivery will be coming in 2019. People who want both models will need to make another reservation using a different email address, he said.